i heard it goes in the high 40's and the low 50's with the m5! What engine would get my team pro to about 60 mph? And what engine would get my team pro to do 70mph... probably a full mod engine right?? RE: Enforcer team pro engine upgrade! I own Enforcer Super Sport with a stock G260PUM with a canister exhaust and she is dialed in at 38mph from experiance. I can tell you that the Team Pro and my SS share the same hull design. Once you get your Team Pro broken in you should see speeds in the mid to upper 40's. At those speeds your in for some fun and exciting driving. These hulls are realy not designed for anything over 50mph. Now that I said that if you realy want to hit 60+ with your Team Pro your going to need to put the boat on a diet. 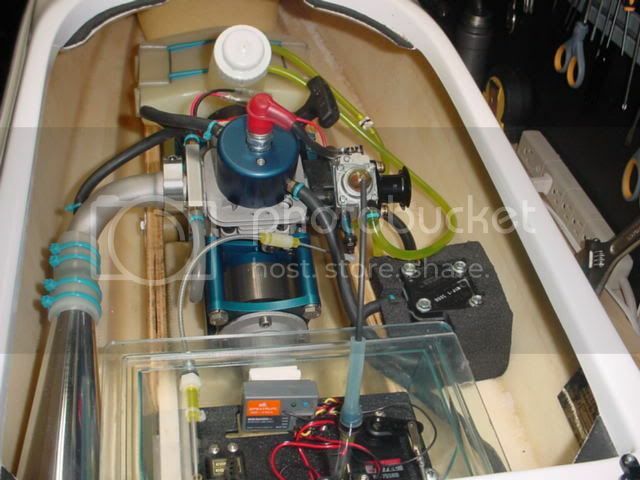 Get rid of clutch get a realy good prop, ditch one of the rudders and work on the Trim tabs or remove them as well. Plus upgrade to M6 and that should get you to 60 for about 300 feet before she flips. I am not trying to discurage you but use the boat for what it is. A fast well built sport boat that runs like a Timex. I realy can not comment on bonzi engines as I have never seen one running at our lake. But I still think the limiting factor is the hull design not the power plant. When we setup ours on the "way" loose side we been have been able to run in the low 40's it is just not as much fun when it spends more time in the air than on the water. BTW the M6 can be used with a clutch, it just will not be as fast with it on. BTW the M6 can be used with a clutch, it just will not be as fast with it on. Leo if I remember correctly Tony says the M6 does not like to idle low enough for the clutch not to engage. Have you seen any R/C boats in person? High 40's is plenty fast, especially for a new boater. You say where your running isn't really calm, so you may not even be able to go past 40mph except on very calm days. I really think you should run the boat for a while before you get tired of the speed, not before you've even got it. I know when I was saving up for my boat, I would have been just as excited for it if it only did 30mph. With some chop, 30mph can be a lot of fun. I was just in the keys bashing 1ft waves at 20, maybe 15mph and it was about the most fun I've had with my magnum yet. Agree ! I have a team pro also with a M-5 and you can get into the low 50's but its difficult, I got a average run of 48 mph and hit 53 mph long enough to get a reading on my GPS but it was about as fast as i wanted to go with this boat. The few tricks i did to get it there was to thin the twin rudders a bit and get them sharp as possible and print the hull from the stern 6 inches. I needed to sand the hull about 10 thou to get it totally flat and then sharpen the bottom edge of the transom. Re-paint and scuff off the gloss from front to back with a scotch pad. Run with a fairly high bow, Very little tab. I am running a prather 270 prop and it's a handful. But fun to run on the edge of a blowover. Keep it stock its a very forgiving fun boat. But if you want to go 60 for cheap just pick-up a good race hull and use your M-5, I bought a proboat hydro and with about $250 and my other M-5 i am getting in the high 50's with a few 60 mph runs. But also a handful of fun. Mike we are all just trying to help you out here, use the boat for what it was made to do and you have years of fun with it. If your serious about hitting the speed in 60's order the Silex. Well my friend i gotta tell you, I started getting more interested in seeing how fast my team pro will go with the M-5 because of your post. I did a few mods to the hull months ago and never really spent much time tuning the engine, I just finished moments ago running the boat. I work on a lake, A little chop and some engine tuning its running 51-53 solid. Very fast for such a boat, My hands are shaking as i type this post. You wont believe how fast that is until you run it yourself, I am a new gas boater so to me this thing is very fast. You will have a blast at 50 trust me. Don't think to hard about numbers because you will swear it's going 70 when you hit 50 with your team pro. MAN WHAT A RUSH !!!! Have fun !!! The EKG and OKG do work with any radio, they don't have anything to do with the radio system. I had both, and after a couple months my OKG failed, during a run I could hear my engine missing. Wasn't sure what it was, but it wasn't killing the engine. The next time out, she wouldn't start and had no spark. Once I disconnected the OKG she fired right up. Somehow it failed and closed to circuit grounding the source coil. Since day one the terminals coming out of the OKG were loose, and seemed to get even looser as time went on. I'm sure if I emailed Tony about it he would replace it. I just decided to keep it simple and not run it, and just make sure the water is flowing ever couple of passes. The transom water picks ups are supposed to be less prone to picking up debris, at least that is what I was told by Tony. Now the EKG I would recommend to run on ANY gas model, whether it be a car or boat. EDIT: And Leo the springs Tony uses in his clutches engage at 8500rpm if I remember correctly. I was under the impression these are the high RPM springs. I am surprised to hear that you guys are getting that kinda speed outa this boat. This was the boat that I wanted but ended up with an older Revenge which is in the Mid 40's on slight chop with a BH Hanson Modd Zen 23. If you would like to see pics I will post some. Anyways great to see this boat is what I was hoping it would have been. Maybe some day I will get one to mess with. Team XP/M5 doing low 40's in some confused and mixed chop..
AM Cyclone/ WHH M5 no clutch.. not quite complete here- was finding the balance point in this photo..
RCMK w/about 4.5hp out of the box. go with the rcmk for about $240.00. that should do it. Just picked one up one used there pretty cool Boat! Just getting use to it . Daniel at Enforcer Rc is great help as well. Marc, there were some points mentioned in this old thread. The Enforcer hulls are a little wavy on the bottoms so they have to be blueprinted or the handling gets thrown out of the window over 50 MPH. Weight is not his friend but he doesn't want the boat to go on a diet by removing the clutch plus the additional drag of a dual rudder setup. If the rudders aren't perfectly aligned that can cause additional drag. The best thing you can do is make sure the bottom of the boat is flat, get a good prop and pipe, and a modified motor by Redline.